We all know that history is written from a male perspective and nowhere is this truer than in the civil rights and black power movements of the 1950s, ’60s and ’70s America. British filmmaker Pratibha Parmar‘s wonderful documentary, A Place of Rage (1991), vividly stands apart as a defiant critique of this ‘malewashing’. The film was screened recently during the LLGFF, celebrating its release on DVD which you can pre-order now. Filmed in the early 1990s, the documentary focuses on two civil rights activists and feminists Angela Davis and June Jordan who look back on struggles encountered during the civil rights movement of the ’60s and ’70s. While some of you may only have a vague recollection of Davis’ name, hopefully many more will recognise the iconic image of a young black woman with resplendent Afro, defiantly raising her fist in the air. Davis is a civil rights activist, philosopher, writer, academic and one time state branded ‘terrorist’ on the run. Away from the iconic image, Davis has produced hugely influential works such as Women, Race and Class (1983), which chronicles the ways in which the suffrage movement came to supersede the fight for civil rights in America. Although lesser known, June Jordan is a poet, essayist, teacher and feminist, civil rights and LGBT activist. Her powerful use of language is simply breathtaking and makes the fact that she is little known so much more woeful. Their powerful testimonies are then interspersed with reflections by author and activist Alice Walker and postcolonial academic and filmmaker, Trinh T. Minh-ha. The instrumental role women such as Davis, Jordan and Walker, to name just a few, played within America’s recent history would be almost entirely erased, were it not for groundbreaking and revisionist works such as this documentary. Indeed, we see these great women themselves paying homage to black female role models significant to them, such as Rosa Parks and the little known, yet no less important, Fannie Lou Hamer. This in itself is an act of reclaiming a herstory, forever in danger of being erased from ‘official’ chronicles. 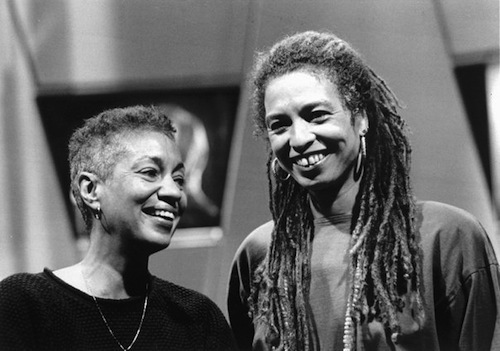 Crucially, these black feminists were not only interrogating the ways in which racism and class exploitation were overlapping in the lives of black women, but also went on to emphasise the need to pay attention to other forms of oppression, based around gender identity and sexuality, within the black feminist movement. Parmar allows Jordan’s commanding voice and intensely truthful vision to captivate the audience, compelling us to question how it could be that Jordan struggled to gather support for gay and lesbian rights from those in the anti-racism movement of which she was an integral part. When Jordan states that the “the sanctity of an individual’s right to love who I want” is necessarily “the same issue” as that championed by the anti-racist activists, she reminds us that racist violence and homophobia exist on the same oppressive continuum. Both women were emphasising the importance of thinking about the various forms of oppression that simultaneously act upon an individual. They were forwarding ‘intersectionality’ well before it became something the wider feminist movement embraced – though, arguably, this is still something we struggle with. The second documentary, Alice Walker: Beauty in Truth (Work in Progress), is another example of the filmmaker’s desire to capture “women as [history making] public icons” we cannot afford to lose. Walker, who is best known for her Pulitzer prize winning novel, The Colour Purple does not ordinarily appear in public. Parmar, however, gives us intimate footage of Walker talking about growing up poor in the southern state of segregated Georgia as well as her work as a civil rights activist and does so beautifully. Acting as a counterpoint to Walker’s own testimony are interviews with notable figures in her life: from former husband, Melvyn Leventhal, to Steven Spielberg and Quincy Jones who directed and produced, respectively, The Color Purple (1985). From all these sources, Parmar manages to gain generous contributions to the piece that draws a compelling image of Walker as writer, feminist, activist and woman. Both documentaries prompt us, both those identifying as black feminists and beyond, to continue the difficult work of interrogating how racism, class, gender and sexuality (to name a few) interweave with one another to oppress many. They remind us that voicing disapproval about oppressive acts committed by members of our own community does not deter us from noticing other forms of oppression and violence. Crucially, these moments of airing our laundry in public take us a step further towards unpacking the ways in which oppression can and does operate. Following A Place of Rage in particular, I was struck and taken aback by the magnitude of what these women had achieved. Today black feminists are fortunate enough to stumble across the works of these great women on our journey to critically consider our identity as black women. We are only able to do so through the writing, activism and political philosophy they have given us. On the other hand, they were formulating all of the above from scratch, inventing the linguistic register with which to fight their cause, creating the very discourse of black feminism. Thinking of groundbreaking concepts such as ‘intersectionality’, that – as feminists and, in particular, black feminists – we now take for granted, I wonder how without them we could begin to coherently discuss and dissect our reality. These women were also quick to recognise that the lived body cannot be experienced and talked about in isolation from the social and political bodies that shape it. Today the feminist movement is often accused of placing too much of an emphasis on the academic at the expense of the lived experiences of women. What feminists such as Davis, Jordan and Walker stunningly remind us of is that the force, vigour and vitality of the movement can only be sustained through a close link with grassroots activism centred on the voices of everyday women. This is exemplified by the fact that their own heroes are grassroots civil rights activists such as Fannie Lou Hamer, a former sharecropper who was unknowingly sterilized as part of Mississippi’s state sanctioned move to diminish the number of poor blacks in the state. Parmar’s women did not have to access feminism as the institution, embodied in gender studies, in order to embrace feminist politics and become its campaigners. Although they all were university-educated and some became academics themselves, the director’s emphasis is on their activism rather than their academic work, illustrating how the former influenced the latter. Feminism back then seems to have been something that was lived and for all, the movement allowing for a diversity of experiences and backgrounds that is woefully lacking in the academic materials, conferences and issues it creates and focuses upon today. I believe that feminism must still take direction from grassroots activism that seeks to address oppression faced by the most vulnerable in our society. As a movement, we often discuss the difficulty of making feminism not solely about white middle class women, of not “preaching to the converted”. Yet very little is done to actively reach women from diverse backgrounds despite the fact that it is not necessarily that difficult. At Black Feminists we continue to ask ourselves how we can ensure that we are reaching out to black women from a variety of backgrounds; during Black History Month we facilitated workshops at local libraries. Sharing their experiences of what it is to be black and a woman in today’s Britain, the women were time and again struck by how invigorating the experience was. The workshop is an example of how we are seeking to reach women who live the spirit of feminism but may not, out of reluctance or lack of knowledge, identify themselves as such. Currently, through a summer school scheme, we are also looking at how we can engage young working class women who are, again, hugely underrepresented in our movement. After both screenings, I left the cinema feeling invigorated by the powerful legacy left to us by black feminists of the ’60s, ’70s and ’80s, but also excited about how we today can continue the good fight. Both documentaries are excellent examples of consciousness raising at its best. I believe that the simplicity of black women sharing their stories – their lived experiences – is still powerful enough to galvanize others into action. Time: That photo of Alice Walker and Pratibha Parmar took my breath away as I found myself still thinking of them as near 20 years younger – making the film Warrior Marks together probably. Lola Okolosie talks about [Black] feminists* making their way without ‘feminism as the institution of gender studies’ – I think about how 20 years has silted up whole rivers of feminism into theory without praxis** and I’m glad Walker and Parmar made the world in their own image. Feminism in the academy is dust unless it is directly nourished by womanist and feminist activism; and by an intergenerational oral herstory where we talk together about those who made the world before us. *Walker is a womanist, womanist is to feminist as purple is to lavender. who made the world before us”. I’m a working class woman. I’ve always had a problem with women’s rights being more or less confined to academic ‘gender studies’. I get that voices heard are often mostly that of the educated middle class, that the movement in many ways still alienates working class women of different backgrounds with its language/middle class concerns. I actually never like the word ‘feminism’ because it theorizes and turns into an ideology the *facts* of my experiences as a woman, if that makes sense. I don’t like this fear that I can’t talk about womanism, or that I’m not welcome if I’m not black, when from what I hear and see the experiences are almost precisely the same as mine (except for being maybe on receiving end of different types of racisms). I agree that the womanist movement should move to reach out to diverse groups of women. I would like to be able to be free to engage too.